Home › Articles › Which switch? There’s an awkward period between first getting interested in mechanical keyboards and actually going out and buying one with confidence. 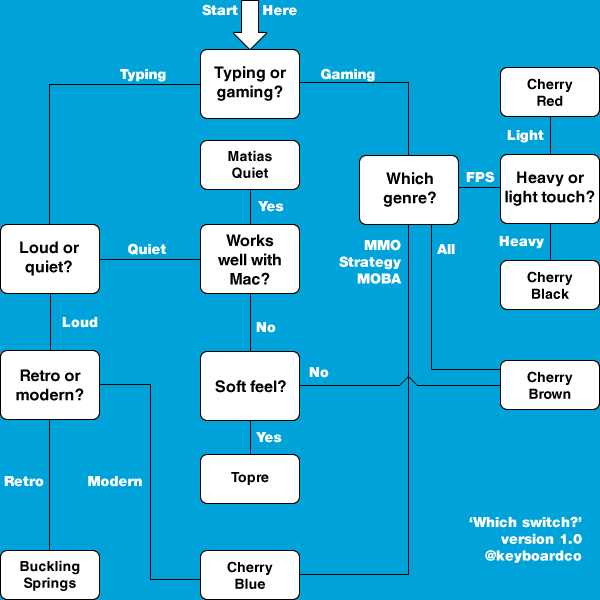 A lot of this stems from one question… ‘which switch?’ With four common Cherry switches, a few uncommon ones and other options altogether, it’s not an easy task. It’s best to try out keyboards with different switches before you commit to buying one, but often it’s hard to try all of the ones you’re interested in. Perhaps your local shop only has Red switches, or your friends all have Brown. In this case, a ‘which switch’ guide like this one will hopefully give you a better idea of which switches seem best for different purposes. In any case, let’s get right into the flowchart. Now that you’ve got your result, you’re much closer to finding the right keyboard for you. If you’d like to learn more about the different Cherry switches, you can view our introduction to Cherry switches. I hope this was helpful. If you’ve got any questions or queries, please let me know in the comments below, on Twitter @keyboardco or on Facebook. Yup, Cherry MX Browns are the most versatile switch. I use them for both gaming and typing and they are perfect. I don’t agree that matias necessarily works better with macs. Topres are plenty loud and more tactile than my blues. Blues click loud but they don’t provide that wide bouncy tactile feel across the whole travel. Im a mac user and I’m interested in buying a mechanical keyboard. Because I’m on a mac, i don’t have tons of choices. The two models I’m interested in are the das keyboard professional s for mac and the razor blackwidow mac layout. The problem is that i read on some forums that the cherry MX blue (the ones that come with both of em) are not adapted for gaming. For example, i heard that the double clicking is not good. I want to play Starcraft 2 with this keyboard so is the MX blue adapted or should i choose MX brown. The problem is that i can’t find any keyboard with MX browns with a mac layout. And another question, can i use a keyboard with a PC layout with my mac ??? I answered your other question elsewhere, but I just wanted to add that you might want to have a look at our Matias keyboards (http://www.keyboardco.com/keyboard_search.asp?sr=matias+mac&ss=code&vat=false&sit=1&sip=1&key0=1&lay0=1&rtv=100). These are designed with a Mac layout, and use Alps switches – to me, they feel similar to a Brown Cherry switch; not too loud, but with good tactile feedback. Have a look! Sure, I learned to play StarCraft on Blue switches and everything went fine. A lot of players like them because you get a lot of feedback (both sound and feel) when pressing each key. Of course, it’s down to personal taste, and double tapping may be slightly easier on a Red or Black switched keyboard. Hope this is helpful!